There are times when it can be a challenge to order the correct birth or death certificate from the U.K. GRO (General Register Office) Online Ordering Service. You need to know several items of information, some of which you may not have and which you hope to obtain from the certificate itself. The GRO search engine requires three specific pieces of information about your ancestor. There are boxes for you to include optional information. The more of the above information you already have about your ancestor -- and the fewer guesses you have to make -- the more successful you will be in ordering the correct record. If you have too little information about your ancestor, use every resource available to find enough information to narrow the possibilities. Here are some strategies and resources that have been helpful to me. Determine the Last Location Where You Found Your Ancestor Alive. Be as specific as possible. It's not enough to know to know the county, or even a city in that county. Search deeper to find, if possible, a more specific location. Old census records will name the county; they may also give a parish, a township, a town, a city, a municipal borough, hamlet, ecclesiastical district, and/or etc. Look at maps of the time period to determine how and where the locations overlapped. Search google for more information about the history of the location. Wikipedia sometimes has specific details about locations in England and how and when boundary changes occurred. As much as possible narrow the location to the smallest geographic area, be it township, city, town, etc. Use Church Parish Records to Help Locate Your Ancestor. FamilySearch has an excellent selection of parish records available online. Use the catalog to search location. Be sure to check whether digital images of microfilm are available online at home or at a FamilySearch Center. Also check whether microfilms are digitized and, if so, whether they're available for home viewing and/or are indexed. Use FreeReg in conjunction with parish records at FamilySearch. FreeReg offers partial transcriptions of parish records of baptisms and burials by county. Search by name, year range, county, and/or record type. Look at Other U. K. Birth and Death Indexes before Going to the U.K. GRO Index. Some indexes give more or different information than others. Use as many as you can find. FreeBMD can be helpful because you can search on a name across many years. Remember that the age in any index or record could be off by several years. Names could be misspelled or suggest spelling variations. After you narrow down the details of your ancestor's birth or death, head over to the U.K. GRO Index, log in or create an account, and click through to the index you'd like to use. 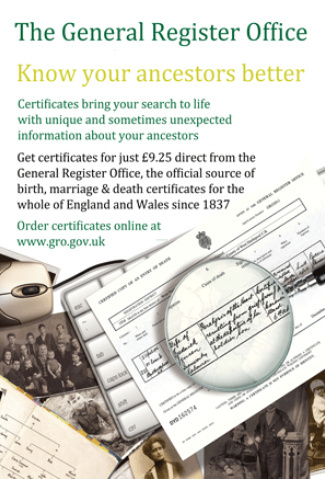 If you need basic information about using the U.K. GRO online record ordering service, see Paul Milner's excellent blog post, NEWS: New GRO Birth and Death Indexes and Digitized Certificates for reduced price – short time only, at Paul Milner Genealogy. It was written a number of years ago when the GRO first initiated the limited-time pilot program for purchasing digitized certificates. The dates in the post are not accurate but the rest of the information is. The GRO is currently offering digitized certificates for a minimum of 9 months from October 12, 2017, which means until at least July, 2018. Now, because I didn't do enough research the first time, I have available to anyone who wants it, the death record of Martha Richardson, widow of William Richardson. Thanks for the tips! And, I love that you're offering to share the wrong death record. :) When I find something good, I often go onto Ancestry and look for someone who has a tree with a lot of documentation and that person. Then, I contact them. Sometimes I get big "thanks" - sometimes I don't. But, I feel better for trying! I had the pleasure of attending an "all day" (4 presentations) seminar with Paul Milner on Saturday speaking about England research. I also bought 3 of his books. I have a lot to learn! That's a great idea for getting the death certificate to a researcher for the person. Lucky you to spend a day with Paul Milner, especially when he spoke about English research. That would have been fabulous!